These hand shapes can be made with either the left or right hand, depending on personal preference, or the intuitive feelings you receive at the time of healing. 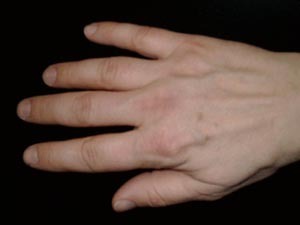 Sometimes you will use one hand, but very often you will use the two together around different areas of the patient’s body. If using a crystal wand, you will sometimes use the wand on its own or together with one or other hand. The hands shown here have been coloured to show the visualised path of light. In reality, and to the naked eye, the light seen emanating from the fingers is often a slightly misty blue/silver-grey colour. 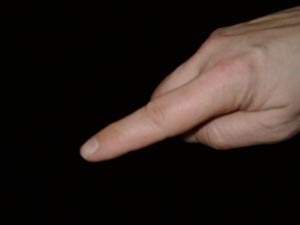 Light from the palm spread hand can be focused out of the finger tips or retained in the area of the palm and focused downwards. 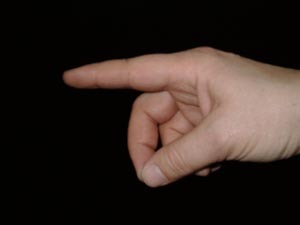 The light from the pointed finger is focused as a beam (shown) or as a soft glowing dome shape. (The light path from the finger Point is the same as the finger Seal Point, so only one photograph is shown). 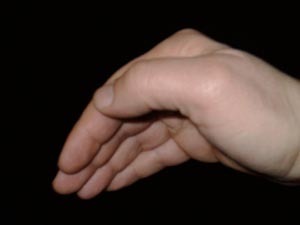 The cupped hand is very good for forming ball shapes or soft glowing cloud shapes. Healing clouds can be drifted over a small area, or over the entire body, of a patient. 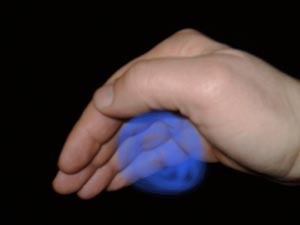 Healing balls can be projected away from the palm at great speed and over vast distances. Often, the colour red will be added to the blue to provide additional energy for the patient.